Leading Exporter of rotary screw air compressors - chicago pneumatics, reciprocating air compressors and rotary screw air compressor from Pune. We are pleased to announce that we are now OEM sales partners for Chicago Pneumatic Compressors. This engagement will now enable us to offer a wider range of established and market-proven products - Rotary Screw compressors - From 3HP to 300HP Compressors, Tank Mounted Air Compressor Packages with Complete Accessories like Air Receivers, Air Dryers, Line Filters as per various applications. These Electric Screw Compressors are available with proprietary IVR technology enabling up to 35% savings in power consumption. This IVR is factory fitted for guaranteed and better results and efficiency. These machines are also fitted with smart electronic microcontroller based controller for optimized performance, operations of the compressors. Besides, we are offering a full range of Refrigerated Air Dryers, Line Filters etc. 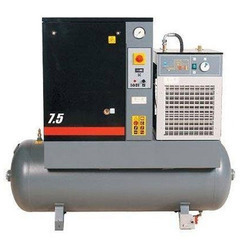 We are offering Air Compressor to our client. The range offered is: 2HP, 3HP, 5.5HP, 7.5HP and 10HP. We are currently, representing and are authorized dealers for Groz Tools and are offering their complete range of compressors. 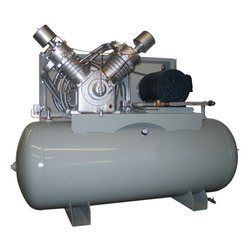 Besides, we are also sales representatives for Chicago Pneumatic Compressors offering a complete range of Screw Compressors from 3HP to 300HP along with Air Dryers, Air Receivers, Line Filters etc. We are manufacturer of Rotary Screw Air Compressor.